<br>Robert Luff & Co are delighted to offer to market this beautifully presented three / four bedroom semi-detached family home ideally situated in this sought after West Worthing location yards from the extensive Goring road shopping parade and with schools, parks and mainline station all nearby. Accommodation offers entrance hall, living room, modern kitchen, large conservatory, downstairs w/c, three bedrooms, fourth bedroom / study and family bathroom. Other benefits include a good size rear garden and off road parking for several vehicles. Wood effect flooring, staircase to first floor, radiator on wall. Double glazed window to side, part tiled standard white w/c, basin with chrome hot and cold taps. Double glazed double doors with double glazed windows either side leading to conservatory, understairs storage cupboard, feature cast iron open fire place, picture rail, wood effect flooring, radiator on wall. Bright room with a glass roof and double glazed windows with double glazed doors opening to rear garden, space for washing machine and tumble dryer, wall lights and radiator, wood effect flooring. Roll edge worktops with matching range of wall and base units, stainless steel sink and drainer inset to worktop with chrome mixer tap, part tiled walls, range style gas cooker with stainless steel splash back and extractor fan overhead, space for dishwasher and integrated fridge freezer, double glazed window to side and double glazed door opening to conservatory. Double glazed window, access to large eaves storage area, picture rail, radiator. Flat wall plaster, double glazed window to front, radiator on wall. Double glazed window to front, flat wall plaster into coving, wood flooring, radiator on wall, large eaves storage space. Double glazed window to rear, flat wall plaster, radiator on wall, large eaves storage space. 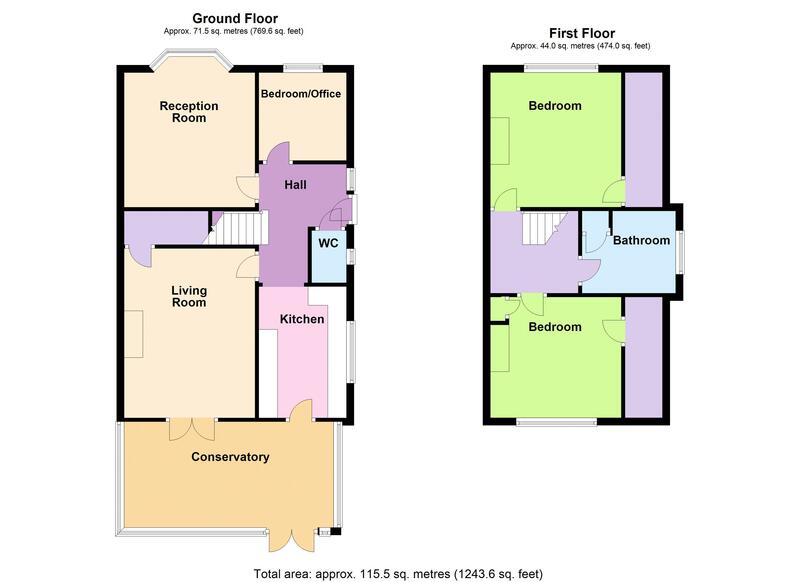 White suite consisting of white panel enclosed bath with mixer taps and shower overhead and glass shower screen, pedestal wash hand basin with mixer tap, push flush w/c, chrome towel radiator, slate effect flooring, double glazed frosted window, airing cupboard. Off road parking, paved to provide off road parking. Mainly laid to lawn and fence panel enclosed, timber built shed.